Fall is in the air, and for me that always means PUMPKIN! In searching for an easy pumpkin bread recipe I stumbled upon an easy one that starts with a box of cake mix. Now of course you can buy your cake mix, but homemade versions abound on the internet. 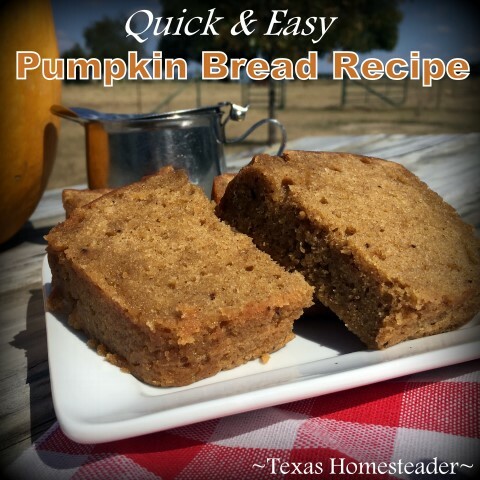 I’ve been making my own spice cake mix (recipe coming soon) and love it in this pumpkin bread recipe! 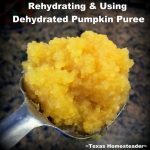 This time of year I have pumpkins from my garden, so I typically use my own drained Pumpkin Puree for the recipe. Remember, you’re using pumpkin PUREE not Pumpkin Pie FILLING. I initially found a recipe over at BabySavers, so I used it as my base recipe. Of course I changed it to suit our tastes, and I love the way it turned out! I already had a spice cake mix prepared & stored in a canning jar to use for either whipping up a quick cake or for using with this pumpkin bread recipe. My homemade spice cake mix calls for 3 eggs & 1 stick of butter, so those 2 items are pulled out for this pumpkin bread as well. I simply mix my spice cake mix with the required eggs & melted butter in a large bowl. Then I add my pumpkin puree and the spices. I mix it all just until incorporated and pour it into a greased loaf pan. You can now bake your pumpkin bread at 375 degrees Fahrenheit (or 350 for glass pans) for 50 minutes, or until toothpick comes out clean. But I baked mine in my solar oven. Have I mentioned how much I [heart] my solar oven?? It’s still hot & sticky in Texas, I just wanted to keep that baking heat outside where it belongs. Based on the light cloud cover of the day, my bread was done in about an hour & 20 minutes. Anyhoo, you can bake it the standard way in a regular oven if you wish. The recipe is below, I’ve added my notes in parentheses. Bon appetite! Combine cake mix, eggs and oil or butter in a bowl. Using a wooden spoon, mix batter until smooth. Add pumpkin and spices. Mix just until until incorporated. Bake at 375 degrees Fahrenheit (350 degrees for glass pan) for about 50 minutes, or until a toothpick inserted into the center comes out clean.